Take a good look at your parking lot, what does it say about your business? Just as the front yard is the first part of a home that a prospective buyer sees, your parking lot is the first part of your business that you customers will see. This is where you make your first impression. That impression can affect how they perceive your company. 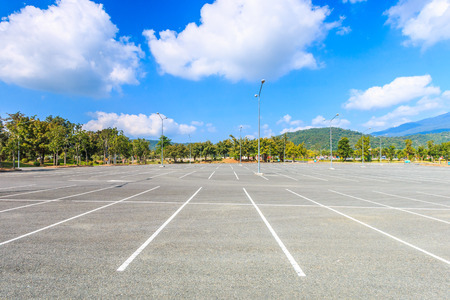 In order to keep your parking lot looking its best, you will need to invest in its maintenance. Regular maintenance improves safety and keeps you from having to spend on costly repairs. Aside from the fact that a parking lot that has been swept free of dirt and debris looks better, regular cleaning can help with the longevity of the asphalt surface as well. Dirt and debris can hinder drainage so that you will have standing water on your parking lot asphalt. That water will eventually damage the surface and leak into the sub base where it will cause cracks. It is a good idea to fill these in before they worsen and further damage your parking lot’s surface. If left unchecked, potholes will grow due to the traffic going over them and because of moisture soaking in under the surface. This has the same effect as rotating the tires on your car in that it helps to even out wear on the surface. By changing your stripes around, you can ensure that tires are not going over the same spots every day. Sealcoating protects your parking lot asphalt from weather damage and damage from the natural erosion of asphalt over time. The amount of traffic that your parking lot sees is one of the factors that you will use when deciding how often to sealcoat it. Most parking lots should be sealcoated at least once every two years. The tips above can significantly lower the cost of maintaining your parking lot. Remember that a big part of good parking lot maintenance has to do with the paving contractor that you hire to do the job. At Dykes Paving, we know how to take care of asphalt. Contact us today to schedule a free consultation.